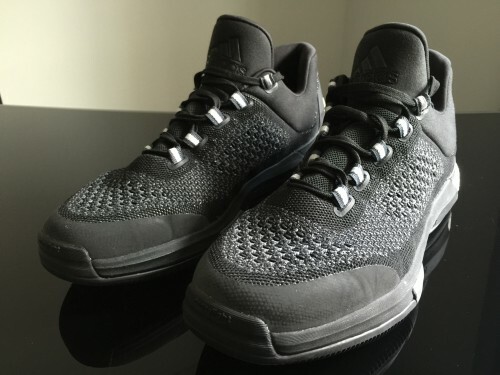 After a review hiatus I’ve able to pick up and hoop in adidas’ flagship shoe, the Crazylight Boost 2015, for the past couple of weeks. adidas is gunning heavily for more market share in the US – the $200 million they gave to James Harden, dropping the NBA jersey sponsorship in order to focus on the product – and the CL Boost 2015 is good first step in that process. 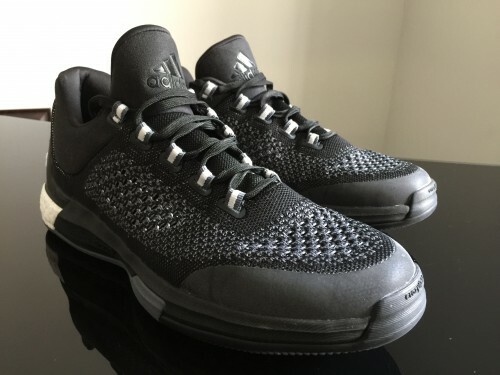 The shoe features Boost cushioning in the heel, which at this point is a proven product, and introduces Primeknit in a basketball model for the first time ever. The CL Boost features two of adidas’ latest and greatest technologies and is priced competitively, but how does it stack up on court? Primeknit, in my opinion, is far better than any iteration of Flyknit to date. It is lighter, thinner, flexes more naturally and conforms to your foot better right out of the box. It’s the closest thing to a sock you’ll put on. The lack of material (not saying this as a bad thing) is almost shocking at first – I could see so much of my neon Team Speed socks through the upper it almost gave the shoe a different colorway! With that said, the lockdown and fit was pretty good overall. The lace loops – so much better than Flywire/Flyknit combos – provide solid lockdown and an extremely tight fit if you cinch them up hard. The upper features a widely spaced knit on the midfoot and toebox, and a tighter knit along the vamp and other areas that will receive stress from lateral cuts. 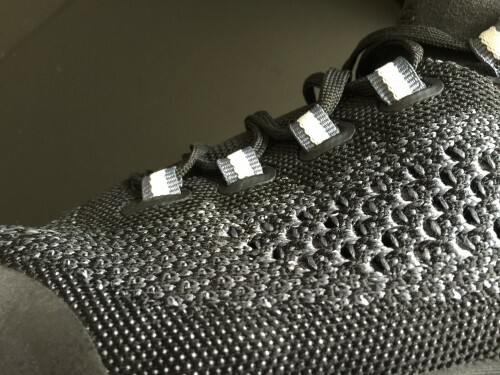 Containment is better than other knitted/woven shoes, but still leaves something to be desired. I constantly felt like my foot was sliding over the edge of the footbed and never felt fully secure overall. Dead space when laced tightly, especially in the toe box, is an issue. Also, the individual lace straps can feel kind of harsh when laced up tight to achieve the most lockdown. The external heel counter is rather large and stiff, and it has to be – the shoe is so low cut that the top eyelet is barely high enough to lock the heel in. I noticed a tiny bit of heel slippage (which may be slightly due to my swapping of the insole – more on that later) but I never felt unsettled or nervous to make a hard cut in that area. Transition was smooth and the shoes were broken in right out of the box. No issues at all in this area. This aspect really begins once you get rid of the atrocious stock insole. 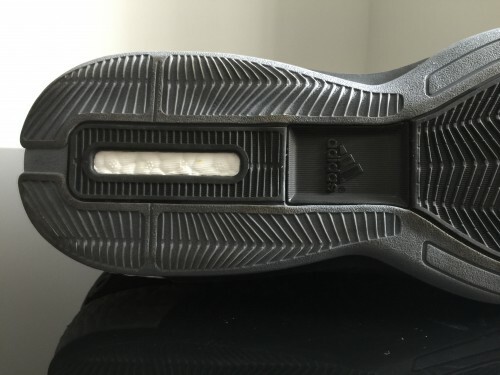 Why adidas put such an insulting insole into their top-of-the-line shoe is beyond me. I tried a couple of different insole swaps, including my old Rose 4.5s and a Crazy Comfort set that I’d been using in my Crazy 8s. The forefoot adiprene+ is pretty thin and firm, so I opted for the extra thick Crazy Comfort set. It gave me better forefoot cushioning and still let the Boost work as it should. It may have raised my heel just slightly and hampered the heel fit, but it’s marginal at best. Heel Boost is fantastic – well cushioned, responsive and aids in a smooth transition. While the forefoot is thin, it provides some support and adiprene+ is a durable compound. It’s miles ahead of last year’s horrific CL Boost. A Sprintframe system is used in the midsole and is rather supportive for a lightweight shoe. There’s also a small plastic piece under the midfoot for some additional support, which is a nice touch for those of us that have tens of thousands of court hours on our bones. The shoe plays very low to the ground and is fairly stable despite the upper lacking some containment. 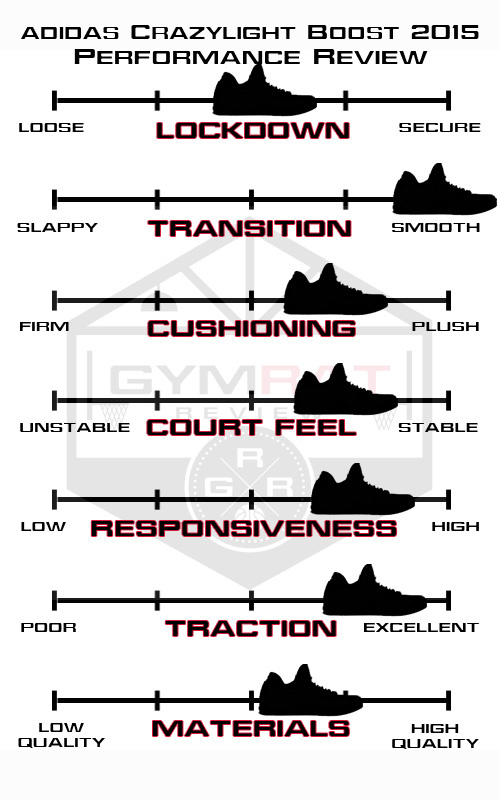 Responsiveness is also high, and overall comfort is good as long as you swap insoles. Switching the stock insoles for some thicker ones also helps the dead space issue up front as well. 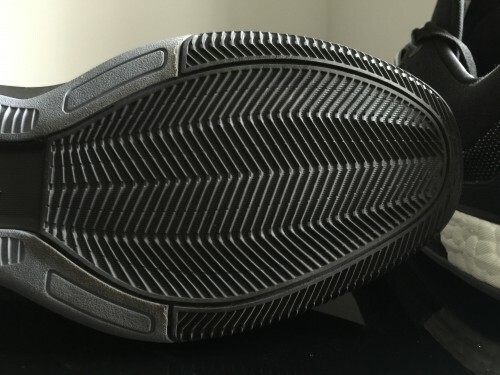 After being a massive failure on the Crazylight Boost 2014, traction is way better on the 2015 model. Featuring a blade pattern, I’ve found great traction on the various YMCA and high school floors I’ve been on. Most of those courts were at least relatively clean, but I could see the compound picking up some dust on a bad floor. I would not advise using these outdoors either, as the rubber is fairly soft. For now though, traction is really good. It remains to be seen how the super thin Primeknit holds up but so far, so good. Primeknit has a thin Fuse-ish coating on its threads for further durability without making the knit stiffer than it needs to be. The outsole should hold up well on clean courts but I could see it wearing out over the course of a season of practices/workouts/games. Boost and adiprene+ both are fantastic cushioning units and also should hold up well. If you’re a high school or college athlete, I do have some concerns about the knit holding up over the course of a season, but I don’t know if I ever made it through a HS/college season on one pair of shoes (which is why I typically had a pair for practice and another for games). As I mentioned before, I have some decidedly mixed feelings on knitted uppers on performance shoes in general. The technology is amazing and the green processes involved are obviously fantastic. But for pure performance, I’d gladly take a different platform. It’s impossibly light and comfortable, is good enough in all areas, and is damn good looking too. I buy less shoes than I used to and am still hooping on the regular, but these probably won’t stick in my rotation for next to my Rose 5s/Crazy 8s/Curry Ones. Yep agree 100% about knits. The feel great but don’t keep your foot place on cuts. Kd 8 is the only shoe that does a good job. Great review as always! Hahah I saw you got those . Ha just got mine in yesterday first run tonight ! Boost volume increase is very noticeable . Ha Yep the 5 is great just needed a new insole . Welcome back bro, good review and yeah get those new Rose and review em. I always like seeing your reviews. I haven’t used any knitted/woven basketball shoes because from trying them on I always had the same thoughts that you pointed out. Too much dead space and not enough containment. It has been hard though considering the awesome looks that that knits can give off. Yeah I have a tendency to forget my sliders on the first draft haha I will upload the new ones after work. These and the rose 6’s will still be on my radar since nike and JB are too overpriced for my taste so far. 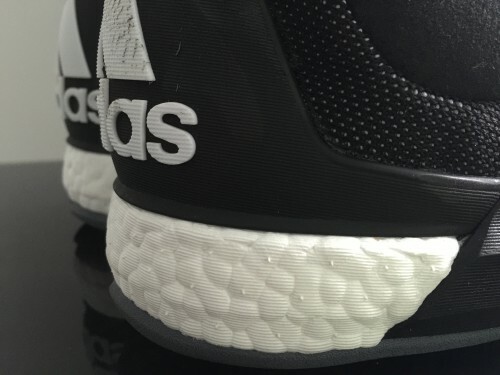 In regards to the CL boost 2015, did you feel a lack of midfoot/arch support. I see that shank but just wanted to make sure. Yeah I’ve looked at em before, I guess I didn’t really think of them as a pure knit like flyknit or Primeknit – but I do think the construction is cool, they just need to hit clearance haha. Welcome back! Very in depth review! Excellent as always!